We are pleased to announce that Texas impressionist, Michael Holter, will be giving a special presentation for the Baltimore Watercolor Society on the evening of Wednesday, January 20, 2016 from 7:00 pm to 9:00 pm at the Hawthorn Center in Columbia, Maryland. 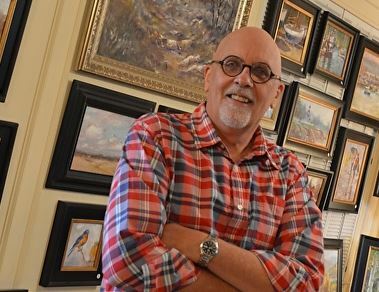 Michael will discuss his painting journey and process, demonstrate painting techniques and answer questions from those attending about his work in watercolor and oil painting. Michael's current work falls into two categories: watercolor figurative paintings and oil landscapes (both plein air and studio). 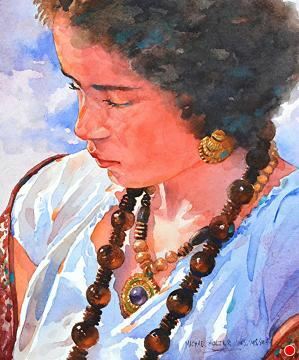 Michael's paintings have received numerous awards and recognition, and they can be found in private and corporate collections in the US and several foreign countries. Although Michael has been painting most of his life, his work experience spans a wide range of creative endeavors, from art teacher, creative director and businessman in fine art and commercial art. Michael has owned and operated two galleries. Michael holds a Bachelor’s Degree in Art Education and an MA in Visual Communication. Michael says, "I think of my work as impressionistic. I like to represent people or places and allow the painting to evolve from the structure of what is recognizable. The challenge is to balance the care needed to make the representation interesting… and perhaps believable, with the freedom, looseness and painterly quality that makes painting so unique and expressive." "I have been influenced by artists such as Charles Reid, Richard Schmid, Burt Silverman, Frank Webb, John Singer Sargent, Ted Nuttall and many others. Even though I have an art degree, most of what I put into practice is self-taught through studying the work of these distinguished artists and much painting." Please pay online via PayPal if possible. Otherwise, checks should be made out to Baltimore Watercolor Society and mailed to me at the address below. For online registration, visit www.bws.onefireplace.com and go to Public Events. Participants will be limited to 35 people. The program will take place at The Hawthorn Center in Hickory Ridge, Columbia, MD. The address is: 6175 Sunny Spring, Columbia, MD 21044.